The ending of the High Holiday this year, 5778, was over-charged emotionally. It did reflect the shockwave of grief reverberating throughout the Jewish world caused by the vicious murder of Ari Fuld two days before Yom Kippur and two weeks before the culmination and the end of the High Holidays. We spent Simchat Torah with our dear friends of the Jewish community of Estonia in Tallinn. This community and their beautiful modern just over 10-years old Synagogue is known as a magnet of the Jewish life in the Baltics. The small community of 1300 Jews there is blessed with the rabbi extra-ordinaire, the Chabad’s Shmuel Kot, talented, intelligent, warm and very kind person who did manage to built not only a landmark synagogue in the place which has declared itself as “Judenfrei’ the first in Europe, but also infused the life and feeling of a family into his community and everyone who is visiting Jewish Tallinn. It was cheerful, Chabad-style, noisy and enthusiastic celebration with Torah scrolls dancing and many happy people of all ages and walks of life participating. On the rainy autumn evening inside the Beit Bella Synagogue it was jolly, warm and electrified. Until the moment when the men dancing with the Torahs scrolls, all of them antique, and some, as the one with which my husband Michael was going around, with its original worn down, fragile and very touching faded in colour purple parochet, of more than 200 years old. We followed the procession. The picture which I saw in the dark large courtyard of the synagogue was magnetic, somewhat mystical and certainly unusual for a outpouring joy on Simchat Torah. In the centre of the dark courtyard, there was a circle formed by about 30 men, many of them holding Torah scrolls tightly. These Jews were from different countries: additionally to the domestic Estonian Jews, the guests from Israel, USA, Germany, Finland and Russia. Some women guests of all ages and children were standing nearby watching enthusiastic dancing which had been halted for a moment, without any warning. Rabbi Kot came from his place in the men’s chain to the middle of the circle and sat, straight on the ground. People around were having a questioning looks in their eyes. Rabbi Shmuel started to sing. A beautiful, haunting melody of Ani Ma’amin went from a wet asphalt ground to the sky. Then, raising up and standing in the centre, Rabbi Kot told a brief story of the origin of the song to the people around him: “This song had been written during the Holocaust , on the train to Treblinka. The rabbi who composed it right there and then, said to the people who were around him in that overcrowded cattle wagon: “If just one of us would survive – and remember this song, and will pass it to our brethren, we all will be living too, because we will be remembered”. And indeed, it did happen that way – because 78 years later, we are singing the song, here and now. The same, how the Nazis and all Holocaust perpetrators just could not exterminate us as they have expected they would, – because we love and remember each other , and have our eternal strength to live on -, no any other enemy of the Jewish people will ever succeed as long, as we will keep together, remember and love our Jewish brethren, and live by the Torah principles. And now let’s go from this reflective song and mood to more energetic and joyful melodies, because it all is the same circle of our lives, as we are standing now here in this circle together!” – exclaimed Rabbi Shmuel and led joyful Yiddish Jewish song loudly. A mighty and beautiful female voice linked to the men’s performance. Modestly dressed mid-aged woman standing nearby was singing with such feeling that her face was glowing, literally. I rarely saw more beautiful woman’s face in real life, not on the portraits in museums, than on that October evening of Simcha Torah in Tallinn. The young Israelis in the circles were listening the Yiddish songs with a keen interest, but they could not join us in singing it with words. The choir in Hebrew, in turn, went on in a double volume as all the present could do it Hebrew perfectly well. I was following the faces of the young Israelis who were visiting Estonia and joined us all for the evening. You could read all spectre of emotions in a matter of minutes unfolding in them: from gaiety through exalting to reflection and thoughtfulness. Later on, they were speaking at the large festive table which is so characteristic for the hospitable Tallinn Synagogue. Those young Israelis, men and women, all after their service at the IDF, all around 25 or so, one after another were telling us that ‘this is my first Simchat Torah’, ‘my first visit to a synagogue’, ‘my first celebration’ ( of a Jewish holiday). They all loved it, they were full of joy, happiness and excitement. The people around table were gasping and eye-widened. ‘And who is living in galut, if I may?..’ – asked the one of the Tallinn community’s leading figures. Rabbi Kot, Jerusalemite in many generations, was very happy though. People were looking at him expecting something interesting. They know their Rabbi. “You see, what you are doing here, my dear Chairman? 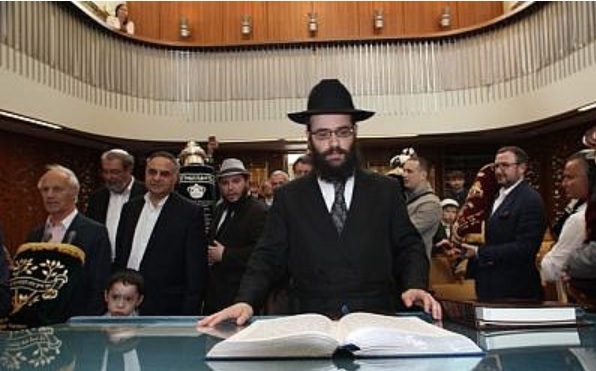 – Rabbi Kot was addressing the Chairman of the Jewish religious community Boris Oks, devoted and able person who for many years masterly keeps the community’s affairs in a good shape under and despite any circumstances. – Do you realise it, dear Boris? Here we are having Israeli young men and women, adult enough, all around 25, all after the service in the Israeli army, who had never been to a synagogue, never hold a Torah scroll, never celebrated our holidays – and here, they all are becoming Jews-in-formation. It is us, our community that makes them Jews. Are you getting it? It is such a grandiose mazal! Le’chaim, chaverim!” Le’chaim was enthusiastic from all sides of the big table. Inna Rogatchi (C). 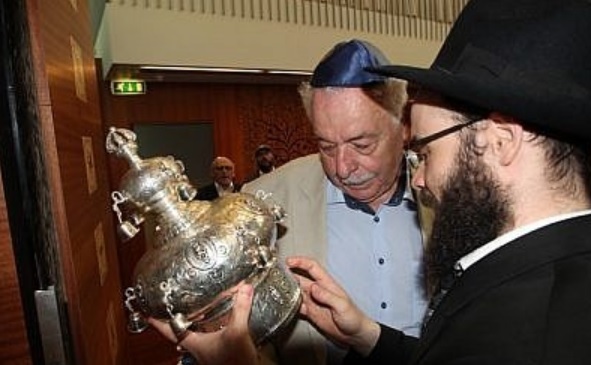 Chairman of the Tallinn Jewish Religious community Boris Oks examining the Torah scroll’s crown with the Chief Rabbi of Estonia Rabbi Shmuel Kot. 2016. But not just le’chaim. As usual around that hospitable table in that family-like community, virtually all present person was invited to tell a story ( the evening before the Rabbi made everyone present to come over to tell on one reason on why that person is happy on the Simcha Torah eve, tactfully mentioning to avoid banal responses). The stories told around the table were dramatic. They were ignited by Ani Ma’amin just a hour before in that dark, wet courtyard, and by the calendar too: Simcha Torah this year was very close to the 77th anniversary of the Babiy Yar massacre, and quite a few from the people present had their families originated in Ukraine. I was telling a specific Simcha Torah miracle story on saving of a Jewish boy in Vilna, who was given as a baby to the Catholic family outside the city. The boy had been baptised and renamed Henryk. He was blond and blue-eyed by nature. His parents found him and after quite a struggle took him back from the family that saved him. The very first time in his life 6-year old ‘Henryk’ was taken by his father to the Synagogue on Simchat Torah. It was just after the war when the walls of the Great Vilna Synagogue were still erected ( until the Soviets knocked it all down in 1950s). There the boy’s father was approached by the Soviet army officer who asked him: “Excuse me please, is this boy, so blonde and blue-eyed is really Jewish?” – “ Yes, he is” – his father replied proudly. – “ Excuse me again, but I have to tell you: I was fighting the about five years all over so many countries by now, and I did not see Jewish boys of this age alive. Can I dance with your boy, please?..” Not only did they danced at that remarkable Simcha Torah celebration at the still in presence Great Vilna Synagogue in 1946, but the boy and the officer had been met again, 65 years after that incredible Dance of Life, after the Yad Vashem researchers’ efforts resulted successfully with finding the officer who did emigrate from the Soviet Union and had become the Rabbi in Detroit. As I spoke, the young Israeli end of the long table that was expectedly noisy, got quiet, and those first-time visitors to a synagogue turned their faces towards me. I did like those faces very much. I liked their eyes, previously smart and witty, now full of quest and compassion. I could speak to them for a long time, and they were absolutely perceptive. Meanwhile the new stories appeared, this time on the people miraculously survived under the pile of corpses in Babiy Yar, and the eyes of our young Israelis men and women got yet more deep in thought and they were shining of contended tears and that fever of determination. It was a great evening. As soon, as I have heard Ani Ma’amin sung by Rabbi Kot, I started to think on Elie Wiesel who had a very special attachment to the song. He wrote his own version of it, both heart-breaking and delicate, as our great friend and mentor was himself. He published it in a form of a soulful book which jacket and end-paper he designed himself in a very rare for him motion. The end-paper is nothing but a music score, a copy of the sheet that found its way in mid-1940s from Palestine to New York. It was the letter sent by the son of the Second Modzitzer Rebbe Taub to his father, famed also for his great music talent through which he kept his followers closer to Jewish spirit and values. The story of saving Modzitzer Rebbe and smuggling him from the occupied Poland in 1940 by his devoted followers deserves its own chapter. Why did his son was so eager to send the sheet with the Ani Ma’amin music to his father? Because of the three reasons: it was not just a music but sacred and unique Ani Ma’amin; it had reached him in the most dramatic way; and – the author of that plea to the Creator, the man in the cattle wagon to Treblinka, Reb Azriel Dovid Fastag was the Modzitzer Rebbe’s close pupil. He was known in his own right as a very good and popular cantor, too. How did the score reached the Rebbe’s son in Palestine? According to the narrative we have, after spontaneous composing the music to the Maimonides’ 13 Principles of Faith which is the words for it and which had come into the Reb Fastag’s mind and soul on his way to Treblinka , he spoke to the people around him in that cattle wagon. He promised a half of his own share in the World to Come to the person who would be able to deliver his composition to his teacher, renowned Modzitzer Rebbe. Just to think about it: thinking this way at that moment; being inside a cattle wagon to Treblinka. Who have said that our people were ‘lambs going for the slaughter’? They were courageous and dignified. They were able to think clearly and to see far. I Believe- sung Dovid Fastag in his train to Treblinka; I believe – Ani Ma’amin, thirteen times, special, positive and meaningful number in the Judaism. In the end of his life, that Jewish man, the soul that had been inside him, went on to compose the music for nothing else but Ani Ma’anim, I Believe. There is no more courageous people – even if they were put on those trains. Especially because they were put on those trains. As Elie Wiesel and his family were – and that’s why that song meant so much for him to the rest of his life. In the transport from Warsaw to Treblinka, there were two young men in the wagon who wanted to try. They said farewell to their families heading to the end. They managed to crack the roof of the wagon and get outside. They jumped as the train was moving into the night. The Night. One of them did not manage, but another one did. I am thinking: just incredible – it could be only one person who was ready to take the risk, and if he would not get alive jumping from the train, the ultimately important message of the tattooed souls would not come through. But it were two of them, mercifully. Eventually, the story and the score of Ani Ma’amim as we know it, had reached the son of Modzizer Rebbe who lived in Palestine, and soon after he sent it in the letter to his father, the beloved teacher of Azriel Dovid Fastag. The Modzizer Rebbe who have had a great influence on the world Jewry at the turmoil-ridden time of the Shoah, is said to be moved very deeply. We know that he himself started to sing this version of Ani Ma’amin, and this is how it has become so popular and stays so. As it happened, during his own trip to Jerusalem, Modzizer Rebbe who was 61 at the time and who died there in 1947, was the last Jewish person buried on the Olive Mount before the liberation of Jerusalem twenty years later. Nothing is coincidental in our life. We know it, and we still are getting reminding on that. Just two days before Simcha Torah this year, on September 28th, it was the Elie Wiesel’s 90th birthday. There is a wonderful episode of Elie’s publicly singing his beloved and fundamental for him Abi Ma’amin recently enough, in April 2014. When the March of Living ceremony, the first one after his passing, was carried on in Auschwitz and Birkenau in 2017, his son Elisha standing for his father, did read the Elie’s rendition of Ani Ma’amin. He knew how fundamental this very poem was for his father. A year later, this year in Tallinn, in the warm, family-like re-born Jewish community there, in the company of aspiring Israelis, American, German, Finnish, and Russian Jews, led by deeply feeling and understanding Rabbi, we sung the plea of tormented Jewish souls, of our one common Jewish soul for you, dear Elie. And for all the people on those trains. Inna Rogatchi is internationally acclaimed writer, scholar and film-maker, the author of widely prized film on Simon Wiesenthal The Lessons of Survival. Her professional trade-mark is inter-weave of history, culture and mentality. She is the author of the concept of the Outreach to Humanity cultural and educational projects conducted internationally by The Rogatchi Foundation of which Inna is the co-founder and President. She is the wife of the world renowned artist Michael Rogatchi. Inna’s family is related to the famous Rose-Mahler musical dynasty. Her professional interests are focused on Jewish heritage, Holocaust and post-Holocaust, arts and culture. She is twice laureate of the Italian Il Volo di Pegaso Italian National Art, Literature and Music Award, the Patmos Solidarity Award, and the New York Jewish Children’s Museum Award for Outstanding Contribution into the Arts and Culture (together with her husband).